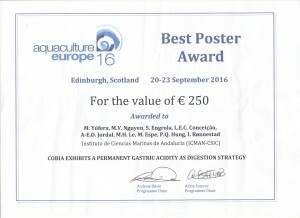 On the recent meeting of the European Aquaculture Society a poster with a dataset from the WiseFeed project was awarded Best Poster. The PI of the work was by Dr. Manual Yúfera who is also the lead author of the poster. All the European authors had WiseFeed secondments in Vietnam to participate in the experiment. Dette innlegget ble skrevet i Uncategorized, september 30, 2016 av Ivar Rønnestad.